Intrepid travellers are blessed with many options in remote locations such as healing waters, dead lakes and Cossack sites. In the eternal debate to determine the exact centre of Asia, the Omsk Region has all it needs to redraw the geographic map. Although it can’t boast of an equidistant point from the continental coasts as is claimed by the city of Kyzyl in the Tuva Republic, or the central importance of regional transportation hub Novosibirsk, archaeologists recently made a new discovery that has the potential to change the naming game. 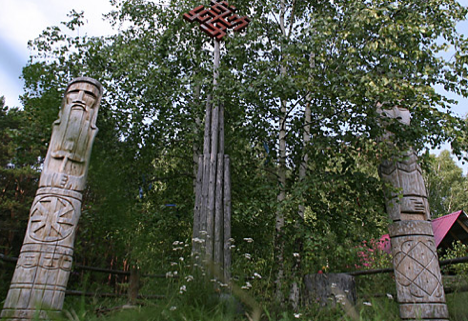 The locals say that, “you never know what kind of miracles can appear in Okunevo.” This remote ethnic village is located 250 kilometres north of Omsk (2.5 – 3 hours by car or five hours by bus) and attracts numerous pilgrims and travelers with a laid-back atmosphere that makes people lose their sense of time and space. This place is known for being a strong Siberian place of energy owing to its similarity to the indigenous word “Om” (verity) and the geographical name of the region. There’s even a Siberian “ashram” in a wooden cottage in the village. Legend has it that four taiga lakes located nearby the village – Lynevo, Schuchye, Danilovo and Shaitan – boost health and can offer kinetic powers to those that manage to find a way to their shores, take a mud bath and bathe in its healing waters. Siberian prophets maintain that these lakes were literarily created from the sky, because they appeared thousands of years ago as a result four fragments that broke off from a giant meteorite. The lakes are connected by an underground river with healing waters. Omsk residents believe that trying mineral waters of meteoritic origin and swimming in their pools offer incredible benefits to skin, thyroid and joint problems. Ebeyty Lake is an endorheic mineral lake situated 150 kilometres from Omsk in an ancient erosional tectonic basin, the deepest basin in the region. The basin is so huge it spreads across three administrative districts of the region. Located in a small valley with saline landscapes for many kilometers across the shore, this sky-blue lake is surrounded by endless steppes. There are also dam beams, with the most attractive being the Amrinskaya beam Amrinskaya Balka; for more information see: mpr.omskportal.ru The largest salt lake in the region, Ebeyty Lake, has been a natural hydrological monument for almost 30 years. Ebeyty Lake has a depth difference of 80-85 meters from the watershed to the water level and the mud composition of the lake is curative. Surrounded by rugged terrain, the lake can be reached only when the weather is very dry, otherwise visitors risk being subsumed by quicksand. Those that make the tough trek are treated to an extraordinary concentration of chloride-sulphate, high alkalinity, enhanced sodium, calcium, magnesium, chlorine, hydrogen, boron and even bromine in its waters. These combined elements are a panacea for many ailments. A trip to Ebeyty Lake can take a full day as its about three hours by car from Omsk each way. It is recommended to bring necessary supplies such as water, food and mosquito repellent, as insects come out in droves in the evening. Laying claim to the center of Asia from the geopolitical point of view has always meant — from the tsars to military admirals — controlling the entire continent. And in these varied quests, Omsk has always played a highly strategic role. Cossacks elected it their Siberian capital in the past, but currently their headquarters is in the village of Generalovka, close to the border with Kazakhstan, about an hour’s ride from Omsk. For many years Russia’s most strategic outpost in the area was the village of Generalovka, not Omsk. There is also an exhibition on Siberian Cossacks at the ethnographic archive here. Along the ancient road that connected Moscow to Siberia one can visit the villages of Stanovka and Forpost. Here tourists can dress as prisoners in rags and be escorted by Cossacks on horseback through a swampy landscape similar to the conditions of nearly 300 years ago. The “new arrivals” can retrace whole sections of the historic route of exile and learn about local wildlife and try traditional food. It is also possible to visit the Bolsherechye ethnographic complex to learn about peasant life and old traditions. The only rural zoo in all of Russia is also located here.